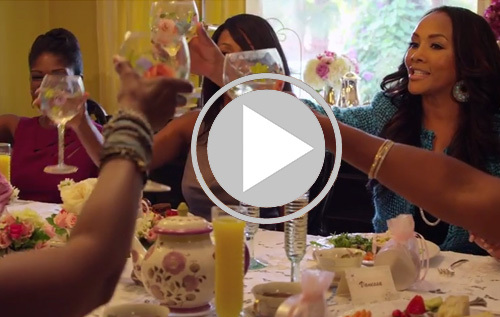 Actress Vanessa Bell Calloway (Shameless, Hawthorne, Coming to America, and What’s Love Got To Do With It) hosts an exclusive and intimate ladies tea party and a dinner party in her home with some of her closest friends. Guests for the ladies afternoon tea include actresses Loretta Devine (Grey’s Anatomy and Waiting To Exhale), Vivica A. Fox (Kill Bill and Independence Day), Shanola Hampton (Shameless and Things Never Said), Edwina Findley (Treme and The Wire), Nichole Galicia (Django Unchained and Love Don’t Cost A Thing), and Robi Reed (Casting Director). Guests for the dinner party include Wendy Raquel Robinson (The Game and The Steve Harvey Show), Salli Richardson-Whitfield (Playin’ for Love and I Am Legend), Vanessa Williams (Soul Food and Raising Izzie), actor Dondré Whitfield (Lying for a Living and Middle of Nowhere), playwright Donald B. Welch (The Divorce and Love Buddies), attorney Shawn Chapman Holley (the Lindsay Lohan and Michael Jackson trials), and Vanessa’s husband of 25 years, anesthesiologist Dr. Tony Calloway. 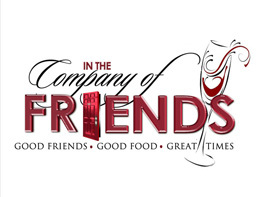 In The Company Of Friends allows the viewing audience to get an up close and personal view of celebrities and other interesting and accomplished people. The questions Vanessa poses to her guests lead to lively conversations that range from amusing to thought provoking. At both the afternoon tea and the dinner party, guests dine on delicious meals prepared by Vanessa, and the conversation is hilarious! Vanessa’s table settings are exquisite and add an alluring touch to the gatherings. Future shows will feature intimate gatherings held at Vanessa’s home with various themes and guests. I love the web series idea. I will pray for your success with this endeavor. You are a talented and classy woman. I am proud of you my Soror!